The second holiday gift idea for 2011 is a gift from Gourmet Gift Baskets. 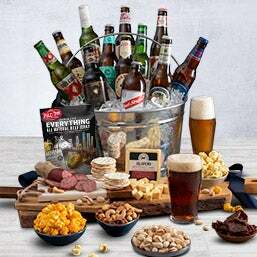 I've been looking around for something to get members of the family, and gift baskets have been high on my ideas list. They're already packed to ship and I can set the day they're delivered. 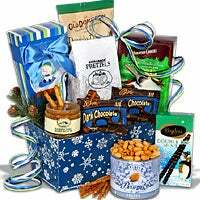 And they have great variety--including care packages, breakfast items, chocolates, and even beer gift baskets (maybe Mr. Kim Chee would like one...) They also have baskets with same-day delivery! Baskets range in price from $24.99 to $299, so fit everyone's budget. But the best thing about Gourmet Gift Baskets is that they're sending baskets to our troops. 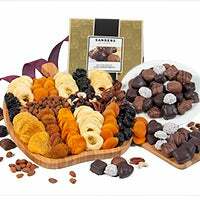 Gourmet Gift Baskets has offered a great opportunity to bloggers. For each blog entry reviewing their baskets and/or site, they will send two care packages to injured soldiers who will be spending their Christmas at Walter Reed Hospital. What a lovely gesture! So, if you're looking for an easy shopping experience from a generous company, check out Gourmet Gift Baskets!